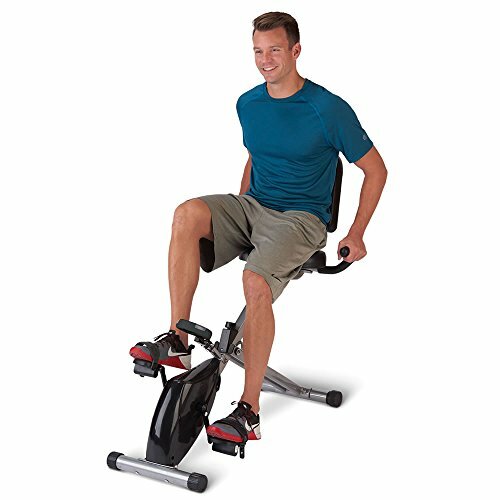 Available only from Hammacher Schlemmer, this is the recumbent exercise bicycle that folds in seconds to half its set-up size for unobtrusive storage under a bed or in a closet. Unlike traditional stationary models that force riders to pedal while hunched over (causing unnecessary back strain), this recumbent model encourages users to sit upright and pedal with correct spinal posture. The bicycle has an LCD for simple navigation of workout menus, displaying your heart rate (when gripping the sensors built into the handlebars), exercise time, speed, calories burned, and distance traveled, and the bicycle's resistance adjusts at the turn of a knob. The sturdy steel frame ensures years of reliable use, the foam-padded handgrips and seat provide optimal comfort, and the seat adjusts to suit different riders. Pedal straps keep your feet secured for an even pedal stroke. Integrated wheels ensure ease of portability.